Start your essential London tour off with a wonderful panoramic tour through the city’s most iconic locations. Passing Parliament Square where you’ll see the historic Westminster Abbey, Big Ben and the Houses of Parliament and many more of London’s greatest landmarks. Dating back to the 17th century, St Paul’s Cathedral is one of London’s most precious buildings. 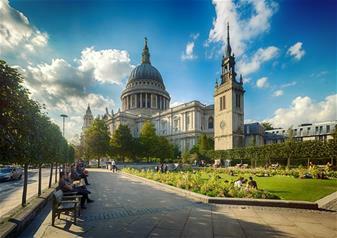 Designed by Sir Christopher Wren, St Paul’s is a real sight to behold. Once you’ve had the chance to soak in the views from the outside, venture inside to the famous Cathedral. Explore London’s tremendous religious history and take in the sights of the crypts and magnificent paintings as you uncover all that St Paul’s has to offer. Experience royal London with a trip to the dazzling golden gates of Her Majesty the Queen’s official residence – Buckingham Palace! Although you won’t get to go inside the famous palace, you will get to see it from the best position possible and have the chance to watch the iconic Changing of the Guard ceremony. Enjoy a delicious free lunch pack to save you precious time spent searching for somewhere to eat. More sightseeing time means more London adventures! The formidable Tower of London is one of the capital’s most iconic landmarks with its rich history making the city what it is today. Having been used as a prison, a zoo, a mint and even a royal home, there is much to explore at the fascinating Tower of London! For a real royal affair, be sure to check out the exquisite Crown Jewels (but be warned, there are protective ravens watching your every move!). Have the special chance to meet a Yeoman Warder during your exclusive tour and learn of the Tower’s terrifying tales of torture and betrayal!